A Brooklyn man has been arrested after police say he pistol-whipped three revelers during a brawl that broke out outside a Manhattan bar following the St Patrick's Day Parade. 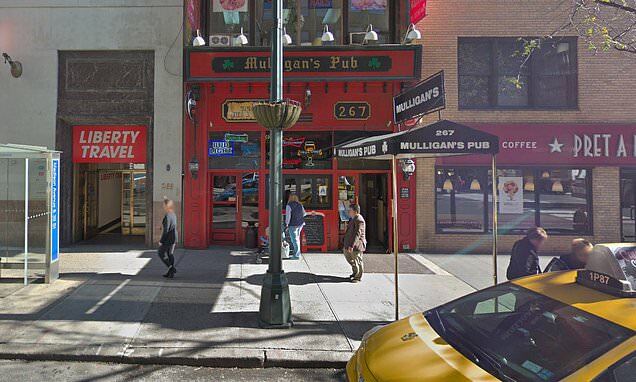 Thomas Hickey, 37, has been charged with assault, criminal possession of a weapon and drug possession in the wake of the melee outside Mulligan's Pub on Madison Avenue shortly before 8pm on Saturday. According to the NYPD, Hickey used a stolen, loaded 9mm pistol to hit two men and a woman in the head during the alcohol-fueled fracas. The female victim, aged 42, suffered an injury in the attack that required five stitches, reported the New York Daily News. The two others, ages 40 and 47, were said to have sustained lacerations and were taken to Bellevue Hospital for treatmet. Hickey himself was also hospitalized for injuries he suffered during the drunken post-parade melee, which spilled from the drinking establishment into the street.